Treasury Secretary Keeps Up Pressure To Raise Debt Limit : It's All Politics In an interview with NPR's Steve Inskeep, Treasury Secretary Jack Lew spoke about the debt ceiling, raising wages and the new potential faces of the $10 bill. 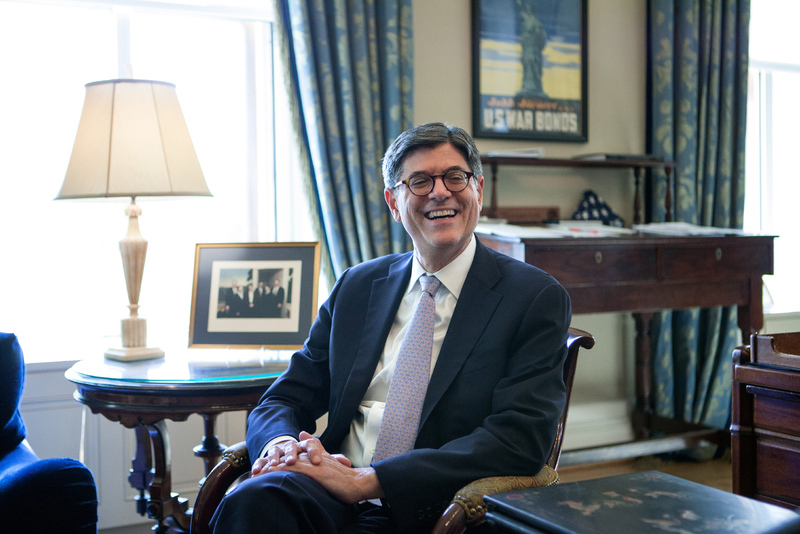 Secretary Jack Lew in his office at the U.S. Department of the Treasury in Washington, D.C., on Wednesday. Treasury Secretary Jack Lew says there isn't much time. Congress and the White House face two big deadlines to fund the government. It will be an intricate maneuver to meet both deadlines even as congressional leadership changes. And in an interview with NPR, Lew described behind-the-scenes negotiations meant to avert a last-minute crisis. "There are conversations going on at a staff level," Lew told NPR's Steve Inskeep, "and I think the key is for Democrats and Republicans [in Congress] to talk to each other." From his office at the Treasury Department, Lew commented on the challenge of doing what should be the routine business of government. A Congress that was never designed to act quickly, and that's been made dysfunctional by partisanship, must resolve multiple problems within weeks. House Speaker John Boehner retires at the end of October; Republicans are voting today on his successor. By Nov. 5, Lew says, Congress must raise the federal debt limit to allow the government to meet its obligations. Then in December comes a deadline to approve spending and avert a government shutdown. 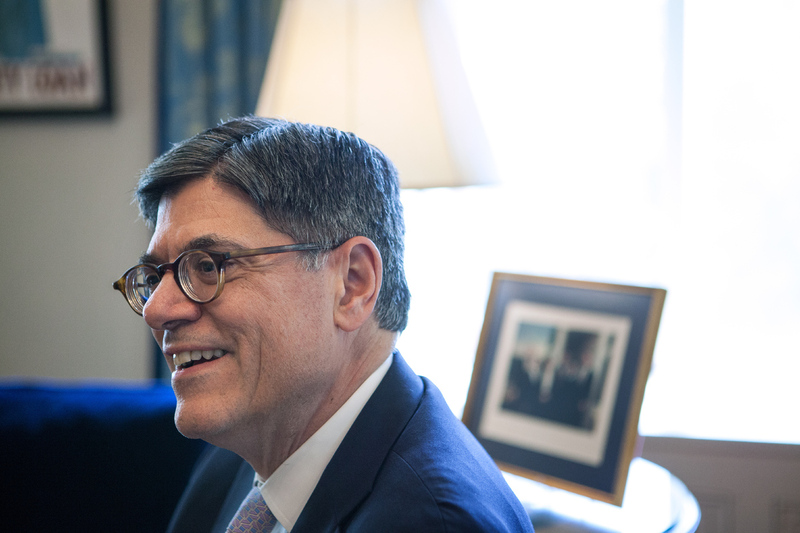 Lew insists the administration will not negotiate over the debt limit. "We have made it clear that we are not going to let the debt ceiling be used as a way to extract commitments that otherwise would be unacceptable." Yet Lew acknowledged that there is a larger conversation underway about measures that could address both the borrowing and spending deadlines, and possibly pass before Speaker Boehner steps down. Negotiators are trying to hammer out something substantive to change the so-called sequester, a series of across-the-board defense and spending cuts put in place in recent years. With Boehner exiting, there's the potential for a longer-term budget deal, possibly two years, that could be passed with Democratic support. Neither Boehner nor Republican Senate Majority Leader Mitch McConnell has shown any interest in another government shutdown over the debt limit. Boehner has also promised to "clean the barn" before he leaves. Lew's comments come as House Republicans are set to vote to pick their nominee to be replace Boehner. White House officials say there are open lines of communication and point to "shared goals." Lew was also echoing some of what President Obama said at a press conference Friday. "When it comes to the debt ceiling, we're not going back there," Obama said. But, the president added, "I do think there is still a path for us to come up with a reasonable agreement that raises the spending caps above sequester to make sure that we can properly finance both our defense and nondefense needs, that maintains a prudent control of our deficits, and that we can do that in short order." Obama also acknowledged his conversations with congressional leaders. "We've always said if it's easier to combine it with something else that's mutually acceptable, that's a form question," Lew said, adding, "that's for Congress to decide. We've told them they need to raise the debt limit. If combining a couple of things together that are on their way towards approval makes it easier — what they can't do is, it can't be used to extract an unacceptable policy commitment." The debt ceiling has been routinely raised in the past — that is, until the 2010 wave election that saw Republicans take over the U.S. House fueled by an influx of Tea Party candidates. The Tea Party has made the national debt, which is now more than $18 trillion, a key part of its platform. In 2011 and 2013, Tea Party members' push to cut spending rather than raise the debt limit pushed the country to the brink of default. Negotiations on major spending reform in 2011 between Obama and Boehner failed, and then, in 2013, the fight over the debt limit led to a partial government shutdown. Treasury warned that the country was within a day of not being able to make its debt payments, and to reopen the government, Boehner resorted to relying on Democratic votes, an unusual maneuver for the majority. There's motivation from both sides this time around in getting a deal done, in large measure, because the future appears so unpredictable. With Boehner gone, there's no telling what the strategy will be of the new House Republican leadership team that is not even in place yet. "Getting to the day before we can't pay our bills, the day before the government of the United States might default for the first time in its history," Lew told NPR, "we shouldn't get even close to it. So the notion that the deadline is the last possible moment to act is a mistake. And it's a mistake which Congress should avoid." "We're continuing to advocate doing something like combining business tax reform with infrastructure to use the one-time revenue that comes from business tax reform to have a big increase in our infrastructure investment. So I think some of the solutions are quite clear, if we could only get the political process to produce them." "What I announced was we were going to be putting out a whole new family of bills, not just the $10 bill, but we're going to be redesigning the other bills in this new series. And I said that there is potentially going to be a number of changes. So I would just invite you to stay tuned and in the end see whether we keep the commitment I made to continue to honor both a woman and Alexander Hamilton and our history of democracy." "What I would say is that everyone is focused on one square inch of the bill. There's two whole sides to a bill. And there is a lot of space to tell a lot of stories."